Los Angeles: Unlike Canada where government officials are blocking attempts by United Arab Emirates airlines to add more daily flights, United States government officials welcomed Turkish Airlines with open arms here Thursday as the Istanbul-based airline made its inaugural flight into Los Angeles. Turkish Airlines were the talk of the town as one of its 13 B777-300 long-haul aircrafts touched down to a hero's welcome at Los Angeles World Airport where fire trucks sprayed huge blasts of water and police and emergency vehicles flashed their lights. The airline took out a front-page advertising wrap in the prestigious Los Angeles Times to announce its long-awaited arrival and there was a sense of jubilation when government officials gathered to welcome the latest permanent visitor to Los Angeles World Airport. Gina Marie Lindsey, executive director of the LA airport, said the opening of a new direct flight from Istanbul to Los Angeles will bring economic spinoffs and support hundreds of jobs in the United States. "In times when we are losing jobs, supporting 1,700 jobs is a very big deal," Lindsey told Gulf News in an interview in the minutes after touch down. "International flights have a much larger economic impact than domestic ones. People who want to stay longer will spend money in Los Angeles to rent cars, on hotels, dinners and going out,"Lindsey said. Estimates by the seven-member board of the LA airport authority show that four direct flights a week from Istanbul to Los Angeles translate into an additional $350 million in annual income for the city. Hajan Tejin, Turkish Consul General to Los Angeles, lauded the airline for investing millions needed to open only its fourth destination to the United States after New York, Chicago and Washington. The only direct flights from Istanbul to the west coast of the US will fill in a missing piece economically and culturally, Tejin told reporters at a press conference at the airport. "This is a special day for us and one that we are grateful to Turkish Airlines," he said. Hamdi Topchu, chairman of Turkish Airlines, was joined by dignitaries for ribbon and cake cutting to officially mark the inaugural flight. With one of the youngest fleets in the world of more than 150 aircraft, Topchu said that the airline now operates flights to 122 international destinations and more than 50 domestic destinations making Turkish Airlines the eighth largest airline in the world. Business has more than trebled for the company since 2003 and he said revenues will increase as more flights are brought online, including possibly boosting daily flights to Los Angeles from the four times a week on Tuesday, Thursday, Saturday and Sunday that exist now. "Our target is to make this flight daily within the near future," he said. In an interview with Gulf News, Topchu said he was proud to see the airline trying new things to attract more fliers, new things such as the new comfort class, between economy and business, that is designed to capture an entirely new segment in the market. With the new class on the LA flights, Topchu said, "we're expecting a load factor of 75 per cent. In our global strategy, we are defining our new priorities. Los Angeles is one of those prioties." Turkish Airlines has been a longtime customer of Airbus but has in recent years bought and ordered 13 new 777-300 long-haul aircraft from Boeing. Topchu said he liked the 777-300 because the wide-bodied jet "is very spacious". 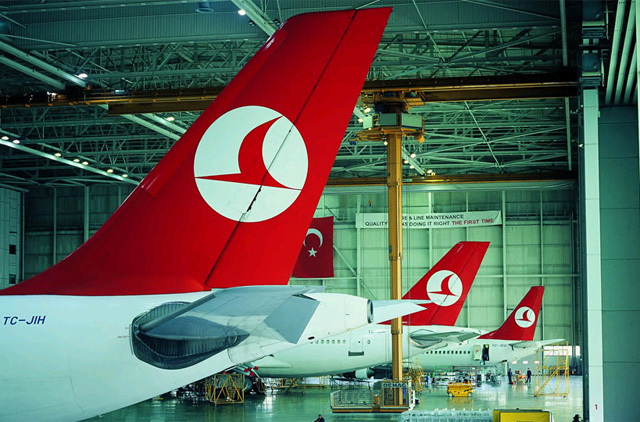 Turkish Airlines is considering buying more new aircraft, he said, but has yet to decide on newer models and which companies. Lilker Mehmet, a 38-year-old Istanbul passenger who works in carpets, said he was pleased with the inaugural flight and said he will do it again. "The flight is very nice, I am very glad I came. I slept very good and I was very comfortable. This was history, the first flight. It will be good for both cities," Mehmet said shortly after landing.